I am a huge Paul Mitchell fan, most probably because the hairdressers I’ve been to for the past 15 years has always stocked Paul Mitchell. The products just always smell so wonderful and you can really feel the difference in your hair, whether that be with a shampoo or a shine spray. I picked up this set at the Clothes show for a slightly discounted price. 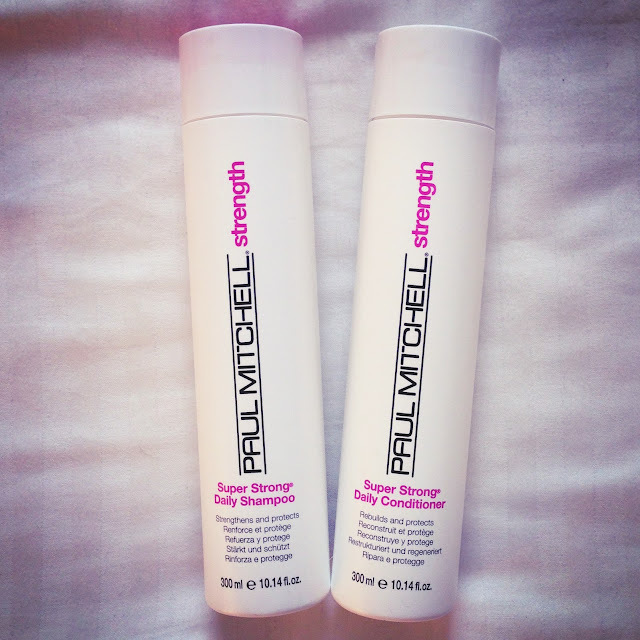 I have tried a few of the sets before, but never the pink, strength products so I thought I would give them a whirl. Straight away on application of the shampoo onto wet hair, the clear gel lathers up really well, so that you can really feel as though you are cleaning all of your hair and scalp. When it is rinsed out, your hair feels squeaky clean, as if all of the oils and dirt have been completely removed. I personally love to have this in a shampoo. The conditioner is equally as fantastic, smoothing and conditioning each hair. I always add more to the tips of the hair and massage it in, and after doing so, the tips of my hair were so smooth and soft. Again, this is what I look for in a conditioner, something that truly feels as though it is working. My hair also dried really well and I could definitely see an improvement in terms of smoothing and reducing frizz. If I could keep buying these I definitely would as they are brilliant and the smell is gorgeous, but I think with the price, they will have to be a purchase I make every now and again. Definitely recommended for you to try!